" In the town of Morganville, vampires and humans live in relative peace but Claire Danvers has never been convinced - especially with the arrival of Mr Bishop, an ancient, old-school vampire who cares nothing about harmony. What he wants from the town's living and its dead is unthinkably sinister." 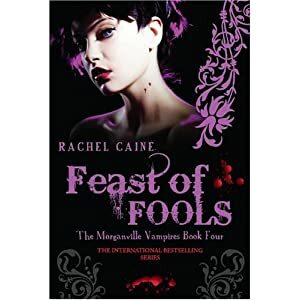 "Feast of Fools" is the fourth book in Rachel Caine's series about the Morganville Vampires. The book came out in the uk in february 2009. A new, sinister vampire has arrived in Morganville. Mr Bishop is Amelie's father, and he is not fond of the humans. Claire, together with a doctor in town, has found a cure that may make Myrnin sane, at least that is what she thinks. And her parents have arrived, and gets to see for themselves what Morganville really can offer. Mr Bishop is arranging a Feast of Fools, and almost everyone in town is invited. Tensions rise between Eve and Michael, when he decides to invite Monica, instead of Eve, to the party. Claire Danvers has had a great progress and development since the first book in this series. She is not so shy anymore and stands up for herself. Monica and her gang of girls does not frighten her, the way they used to. I like the new Claire, she grows from book to book. This is the weakest book in this series. It takes too much time before there is any action and dramatic events. The book was kinda slow and I was waiting for something more interesting to happen. The cliffhanger in the end was ok, but I am not rushing to read the next installment ( which I off course will). I actually enjoyed most reading about Amelie in this book. She is a facinating character and I think Helen Mirren would have done a great job playing her in a movie. He hear Mirren's voice, when I read Amelie's words. I haven't started this series yet, but it seems excellent! !